Power Talent provides leading human capital management firms with new technologies for helping their candidates dynamically position themselves to forward-thinking employers. Having invested in the requisite technologies, Power Talent can be a key partner in helping your firm’s candidates compete more effectively by providing a virtual platform which clarifies and dimensionalizes the depth and breadth of an individual candidate. 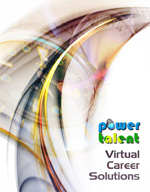 Power Talent’s virtual portfolios act as a turbocharger for accelerating a candidate’s performance and productivity in career transition. Power Talent’s portfolio business solution enables your clients to receive the benefits of virtual career portfolios while allowing your management to stay focused on your core business. Power Talent’s turnkey portfolio business solution is a dynamic technology with supporting best practices which integrate seamlessly and transparently into your firm's business processes. Power Talent offers affordable portfolio content development services for busy firms with high client volumes. Offloading content development to Power Talent saves time and enables career advisors to handle larger client loads. 1. Develop portfolio content from source documents. 1. Forward source documents to PT. 2. Deliver content to career advisor. 2. Secure client approval of content. 3. Build portfolio from approved content. 3. Deliver completed portfolio. e.g., photos, awards, videos, articles. 4. Forward artifacts to PT (if any). 5. Provide portfolio education resources. 5. Educate client in portfolio use.